Explore pristine beaches and charming villages on a vacation on Djerba Island, a small island in the Gulf of Gabes known for its Berber population. Cave of Ali Berbere and Fort Ghazi Mustapha will appeal to history buffs. Do some cultural sightseeing at Musee du Patrimoine Traditionnel Djerbien and El Ghriba Synagogue. There's much more to do: enjoy the sand and surf at Sentido Djerba Beach, get to know the resident critters at Djerba Explore, stroll around Krokodilfarm Animalia, and explore the historical opulence of Fort de Borj El Kastil. To see maps, other places to visit, traveler tips, and tourist information, use the Djerba Island driving holiday planner. London, UK to Djerba Island is an approximately 7.5-hour flight. You can also drive. Due to the time zone difference, you'll lose 1 hour traveling from London to Djerba Island. Traveling from London in July, things will get somewhat warmer in Djerba Island: highs are around 39°C and lows about 28°C. Cap off your sightseeing on the 1st (Thu) early enough to travel to Tozeur. 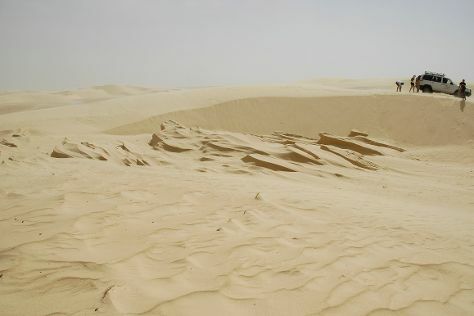 With its otherworldly desert atmosphere, Tozeur has served as a filming location for blockbuster movies such as "Star Wars," "Raiders of the Lost Ark," and "The English Patient." The ancient oasis has successfully preserved its traditional geometric architecture, craftsmanship, and fashion, especially in the medina--the old city--where friendly locals extend a warm welcome to visitors. Eschew the tourist crowds and head to Sahara Desert and Ksour of Tamerza. Step out of the city life by going to Chott El Jerid and La Corbeille. There's still lots to do: explore the stunning scenery at Tamerza Canyon, take a stroll through Le Vieux Quartier de Ouled el Hadef (Medina), and admire the verdant scenery at Mides Valley. To see more things to do, where to stay, maps, and tourist information, go to the Tozeur route maker tool . Getting from Djerba Island to Tozeur by combination of taxi and flight takes about 1.5 hours. Other options: drive; or do a combination of taxi and bus. When traveling from Djerba Island in August, plan for somewhat warmer days and about the same nights in Tozeur: temperatures range from 45°C by day to 31°C at night. Wrap up your sightseeing on the 4th (Sun) to allow time to travel to Beja Governorate. Béja Governorate is one of the twenty-four governorates of Tunisia. On the 5th (Mon), explore the ancient world of Ain Tounga, explore the ancient world of Dougga, and then don't miss a visit to Musti. Plan my day in Beja Governorate using traveler tips and tourist information provided by Inspirock. Do a combination of flight and train from Tozeur to Beja Governorate in 5.5 hours. Alternatively, you can drive; or take a train. Expect slightly colder temperatures when traveling from Tozeur in August; daily highs in Beja Governorate reach 36°C and lows reach 24°C. Finish your sightseeing early on the 5th (Mon) to allow enough time to drive to Sousse. Known for its historic medina quarter, a World Heritage Site, the city of Sousse boasts a rich history that dates back to the 11th century BCE. Visit Great Mosque of Kairouan and Bourghiba Mausoleum for their historical value. Get some cultural insight at El Jem Museum and Medina of Kairouan. Change things up with these side-trips from Sousse: Mahdia Beach (in Mahdia), El Jem Amphitheatre (in El-Jem) and Forte El Ribat (in Monastir). And it doesn't end there: take an in-depth tour of Sousse Archaeological Museum, have some family-friendly fun at Karting Monastir, and contemplate the long history of Medina of Sousse. For more things to do, where to stay, other places to visit, and other tourist information, read Sousse road trip planning app . Getting from Beja Governorate to Sousse by car takes about 3 hours. Other options: take a train; or do a combination of train and bus. Traveling from Beja Governorate in August, expect a bit warmer with lows of 28°C in Sousse. Finish your sightseeing early on the 8th (Thu) to allow enough time to drive to Hammamet. Budget-constrained beach lovers relish a vacation in Hammamet, one of Tunisia's oldest resort towns known for its lush greenery. Explore hidden gems such as Ancient Roman Baths and Palace Dar Nejma Ezzahra. Your cultural itinerary includes sights like Yasmin Hammamet and Carthaginian Ruins. You'll find plenty of places to visit near Hammamet: Tunis (Bardo Museum, Medina of Tunis, & more). There's still lots to do: enjoy the sand and surf at Hammamet Beach, look for gifts at La Deffirence, don't miss a visit to Medina of Hammamet, and tee off at Citrus Golf Course. To find more things to do, reviews, traveler tips, and other tourist information, refer to the Hammamet tour itinerary planner. Traveling by car from Sousse to Hammamet takes 1.5 hours. Alternatively, you can take a train; or take a bus. In August, plan for daily highs up to 39°C, and evening lows to 26°C. Finish your sightseeing early on the 12th (Mon) so you can travel back home.